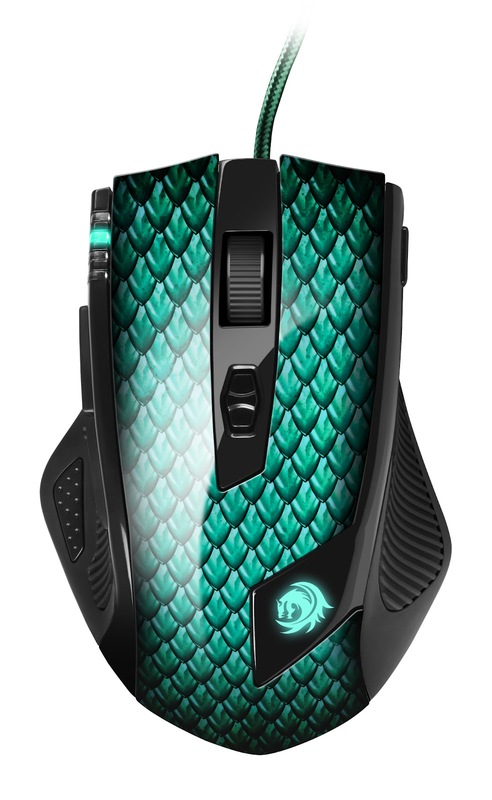 Sharkoon is expanding their gaming product line with an extravagant looking laser mouse: The Sharkoon Drakonia Gaming Laser Mouse suitably matches its name with its bright green dragon scales and illuminating tribal dragon logo. The ergonomic design and rubberized sides ensure that the associated dragon rider has a comfortable and secure ride during long and turbulent missions. The fire of the Drakonia burns from within: The AVAGO-ADNS-9500 laser sensor delivers to up 5,000 DPI resolution, 11,750 FPS frame rate, 30 G acceleration and 150 IPS speed. The set DPI rate is always in view of the gamer through the use of four colored LEDs. Low-sense gamers who frequently allow their dragons to be lifted in the air are supported by the Drakonia by its low lift-off distance of up to five millimeters. The Sharkoon Drakonia can be tamed with its 11 function keys including the 4-way scroll wheel, which with the enclosed software to include the macro-manager can be fully programmable. Software and on-board memory provide numerous configuration options which can be stored in five user profiles. Individual players can also adjust the weight of the mouse: The Weight Tuning System consists of six 5 gram weights. The 180 cm long connection cable has been reinforced by Sharkoon with a textile cover, gold laminate coats the USB plug. A set of replacement sliders is included within packaging. As a suitable playing surface, Sharkoon also introduces a durable textile mouse pad with the Drakonia design motif. The 355 x 255 x 2.5 mm large pad has a nano-coated playing surface with a nonslip "rubber base" and double stitching around the edges to prevent fraying. Alternatively, a "DarkGlider" mouse pad versions is available with a matching design of Sharkoon's similarly named high-end gamer mouse. End customers will find the Sharkoon Drakonia available in authorized retailers. For further questions go to www.sharkoon.com.